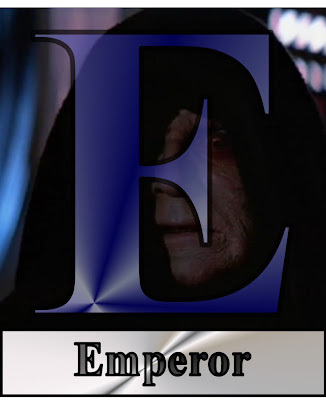 Continuing my series, Star Wars ABC's, we bring you the letter "E."
E is for the Emperor. In a galactic sense, Emperor Palpatine is the master of ceremonies. He's the guy orchestrating everything, pulling the strings of the galaxy and putting all the pieces in play. And what does the Man Responsible for Everything look like? An old man. A frail, death-warmed-over, robed old man who walks with a cane and could use both sunlight and some dental work. I imagine you can't miss the Emperor for two reasons: 1) he travels with quite an entourage and 2) he possesses a certain...muskiness. He gleefully turned a young man into a monster and then sought to do the same to that man's son. He orchestrated a galaxy-spanning war mostly because he wanted to become the Man Responsible for Everything. He became so confident in his role, he then made a moon-size tool of death. When that got destroyed, he built another and decided to toy with his worst enemy by giving them the secret location to his secret new project. The Man Responsible for Everything was unceremoniously thrown down Ye Olde Reactor Shaft for being an overconfident wanker. I guess he really was responsible for everything, including his own death. Big ups, Palpy. Big ups. TOMORROW: The letter "F." She may not look like much, but she's got it where it counts. Live and Let Undead Almost Here! "And the World Stopped" now available! Guest blogging at Superhero Nation!